Heat oven to 350°F. Spray 13x9-inch pan with cooking spray. In large bowl, stir cookie mix, 1/2 cup softened butter, 125 g cream cheese and egg with spoon until soft dough forms. Stir in 1/4 cup cranberries and the white chips. Spread dough in bottom of pan. Bake 20 to 23 minutes or until golden brown. Cool completely on cooling rack, about 1 hour. In large bowl, beat 250 g cream cheese and 1/4 cup softened butter with electric mixer on medium-high speed until smooth. Beat in vanilla. On low speed, beat in icing sugar until frosting is smooth and creamy. 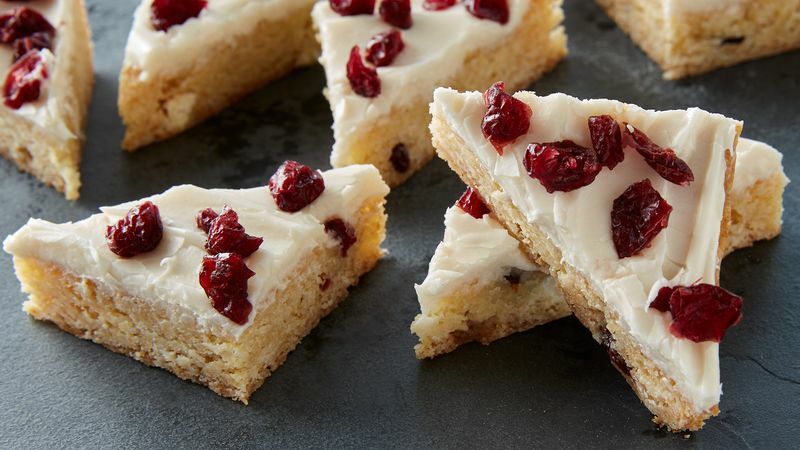 Spread frosting over top of bars; sprinkle 1/3 cup cranberries over frosting. Cut into 6 rows by 4 rows. Store covered in refrigerator. To quickly soften cream cheese, remove from wrapper and place on microwavable plate; microwave uncovered on High about 15 seconds or just until softened. The secret for cutting bars easily is to line pan with heavy-duty or nonstick foil. When it is time to cut bars, just lift by foil out of pan, and cut. This also makes cleanup extra easy.